BlackBerry boss John Chen has expressed his "outrage" in an open letter to consumers in response to a T-Mobile promotion that offered BlackBerry customers a free upgrade to an iPhone 5s. The US ad said: "Get the tools to do more. 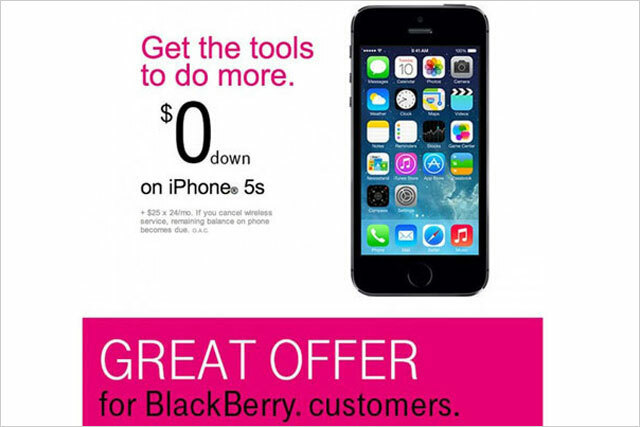 Great offer for BlackBerry customers." While some customers took to Twitter to complain about the ad, BlackBerry’s Chen issued an open letter to thank its "loyal customers" for their commitment to the brand. He said: "By expressing your outrage directly to T-Mobile through tweets, calls and comments in the media and on blog posts, you sent a powerful message that T-Mobile could not ignore." Chen said: "I can assure you that we are outraged too," while expressing puzzlement that T-Mobile didn’t inform the mobile phone manufacturer that they would be launching what he called a "clearly inappropriate and ill-conceived marketing promotion". Chen’s ended his statement saying: "Finally, to T-Mobile, I would like to remind you that our long-standing partnership was once productive and profitable for both BlackBerry and T-Mobile. I hope we can find a way forward that allows us to serve our shared customers once again." T-Mobile apologised for any confusion over the emails it sent to customers last week with the ad, and said it was happy to be a "BlackBerry partner".